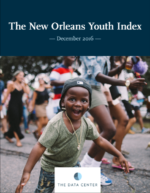 As demonstrated in The New Orleans Youth Index, the issues that New Orleans children face are multi-dimensional. Nobody knows more about these issues and realities than the youth themselves. Youth filmmakers at the New Orleans Center for Creative Arts made these videos using research from The Youth Index and additional data sources to illustrate, through voice, music, and visuals, what data means to them.